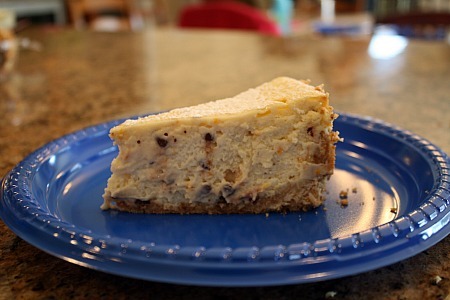 This is one of the best cheesecakes I’ve ever had – no lie. The only problem with this cake is that we didn’t bring home any leftovers 🙂 Oh, and I guess the fact that the crust didn’t go as high as the cake might be another minor infraction. I think next time I’ll keep it strictly on the bottom…no need for it on the sides anyway. Position oven rack to middle of oven and preheat to 375 degrees. Stir cookie crumbs and 3 tablespoons sugar together in a bowl, then mix in melted butter until crumbs get slightly clumpy. Transfer to a 9 inch springform pan and press evenly along the bottom and 2 inches up the sides of the pan (like I said, I’ll probably just cover the bottom next time). Use a plastic bag or wrap to press gently. Bake for about 10 minutes, or until slightly brown. Let cool on a rack. Lower oven temperature to 300 degrees. Put paddle attachment on stand mixer. Mix cream cheese, ricotta, flour and salt on medium speed, scraping sides of bowl frequently, until very smooth and fluffy, about 5 minutes. Make sure cheese has no lumps. Add sugar and beat until well blended and smooth. Add chocolate chips, orange zest and vanilla. Beat until just combined, about 30 seconds. Add eggs, one at a time, also beating until just blended. Do not overbeat. Pour filling into cooled crust and smooth top. Unclasp and remove side of pan and run a long, thin spatula under the crust. Slide onto flat serving plate carefully (or leave it on the bottom of the springform pan like I did!). Garnish with confectioners’ sugar. Dip knife in warm water before cutting each slice, wiping inbetween cuts. This entry was posted in cake, chocolate, cream cheese, dessert, freezer friendly, Italian, make ahead, ricotta. Bookmark the permalink. This looks amazing!! I love cannoli. OMG – I totally need to make this! You just made my mouth water. O.M.G. Cannot wait to try this – just need a reason to make it. Yumm, I can only imagine how delicious it tastes’. Next time you make it, let me know, and I will drive down from Canada to indulge in a piece! Love cannoli! I’ve been waiting for this one since you mentioned it on FB. I say forget the crust on the sides, it actually looks amazing with it halfway up! Cannoli and Cheesecake?! I cannot wait to try this delicious dessert combination. I’ve never had cannoli, but this looks awesome. I need to try it! I’d say you came up with the best solution of all. You can never beat two treats in one. I love cheesecake and this looks incredible. I love how high it is! Wow, this looks good! My husband love cannoli and cheesecake to. Oh wow! I haven’t had a cannoli in forever, and just imagining it as a cheesecake is giving me all sorts of mouth-watering ideas. Love it! I made this for Christmas dessert and it was FABULOUS!! We especially liked the orange zest in the filling! Made this for a family function and it was truly AMAZING! 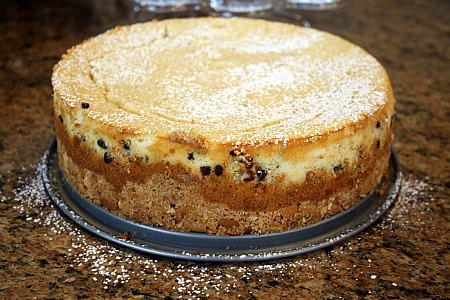 I make a lot of different types of cheesecakes and by far, this is the BEST! I’ve made this cheesecake several times now, and it’s always a hit! Delicious! One suggestion for future bakers: If you decide not to bring the crust up the sides of the pan, I would recommend using less of the crust ingredients than the recipe calls for. The amount that’s currently indicated produced a thick crust that was difficult to cut when I kept it on the bottom and didn’t bring it up the sides. did you have to do a cheesecake bath for this recipe? Can i use splenda or truvia in the canoli cheese cake recipe? I’ve been meaning to try it but haven’t yet, however, I have with other cheesecakes and it’s been fine, so I say go for it! Made this last night. Nothing special. I’ve made better. Following cooking time and description left middle not cooked enough. I will not make again. Looking forward to try cheesecake. Most recipes call for adding eggs, then adding chocolate, flavorings, last. Would it work doing it this way (adding the chocolate and zest last)? I’ve never tried it that way so I’m not sure. Made this for my son’s birthday today. It was absolutely delicious. I topped it with ganache, because there was a crack in it…the ganache really went very well with it. Thanks for the recipe!